One of the biggest paradoxes we are living with, in the current India is, there are millions of jobs created every year in different sectors and we have millions of qualified professionals walking out of the gates of more than 30,000 colleges in India, still the unemployment rate hovers around the 10% mark. This is the official data that I am quoting here, you still have disguised employment, underemployment and people simply stuck at the wrong job. The paradox is a result of a very inherent problem that our education system and our society as a whole faces. We believe in the philosophy of ‘learn and work’ rather than that of ‘work and learn.’ This may seem a juxtaposition of words, per se, but it changes the complete mechanism of how an individual’s career is destined to be in our country. I was destined to be a Mineral Engineer, I even posses a degree in it. Destined because the machinery wanted me to be and I didn’t know any better, very few 18-year-olds do! It was during my engineering at the Indian School of Mines, I fell back to my lost love; computers. I pursued the love at my own expense, wrote programs, failed at them and wrote more and failed more and the cycle continued until I could write successful ones more than the failures. I do not indicate that our education system has always been flawed. The point I want to make is, it needs a change; a disruptive change. We have advanced by leaps and bounds when it comes to technology and its use in information sharing, it's high time we utilize it to revolutionize our education system. The ‘learn and the work’ system has to end and we have to move to ‘learn - work - fail - figure out - learn more’ and then work. The whole lecture-based education system is an aftermath of world wars and the Industrial revolution. Since the Second World War, we have made our universities into a career developing institution by opening up to the masses and selling them an over-priced dream. Imagine the situation of a student who specializes in one particular area, eyeing the career opportunities it has to offer. He likes it when he is an 18-year-old teen, pursues an undergrad degree in the subject. He likes it even more and goes on to pursue a postgraduate degree in the area. He comes out fully learned out of the university but at the age of 25. The age when he is fresh but not at the prime of his energy; that time has already been lost in attending classes and listening to lectures. Now all he has is tonnes of theoretical knowledge and a compulsive career choice because he has already invested too much time on the specialization. By 2040, our young India would have about 600 million people and a big chunk of which will be forced to depend on the service based companies, as our economy dictates. Our top colleges educate and prepare only a few thousand students for such careers. Can we ever educate such a huge resource and use them in our nation’s growth? In a system of education where one guy delivers sermons to 30 other people, my answer is - no. Discover yourself, find what you love, do what you love and nothing can stop you from being successful. May the forces be with you! 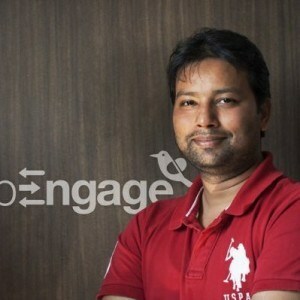 He is the CEO - WebEngage, Ex-burrp, ex-Onyomo, ex-HCL. Startup kid. He has over 8 years of rich startup experience in products and technology. He is an open source guy, salesman, designer, developer, and marketer.